For the local people, the western part of Bratislava is one of the most popular venues for a trip. Just 10 km west of the city centre, Devín Castle is set in beautiful natural scenery. Built on the top of a high crag, it towers over the small village of Devín and the confl uence of the Danube and the Morava rivers which form the border with Austria. Up to 1989 the Iron Curtain was drawn below the Castle, lined with barbed wire. Along the Danube, under the Castle and further up the Morava, the Morava cycle-path leads through landscapes untouched for decades. Above the village of Devín, the highest hill of Bratislava is criss-crossed with a number of way-marked paths which offer spectacular views of neighbouring Austria with Vienna and the Alps in the background. There are actually two castles in Bratislava. Paradoxically, both of them were destroyed within the same two year period. The upper castle, where the permanent exhibition “Devín Castle between the 13th – 20th centuries” is located, offers an unforgettable view. The archaeological finds of the castle Devín and the historical facts talk about the individual phases of the castle building. The exhibition is located in the attractive premises located on the castle cliff. The middle part of the castle introduces an interactive exhibition “History Is Not a Poison. 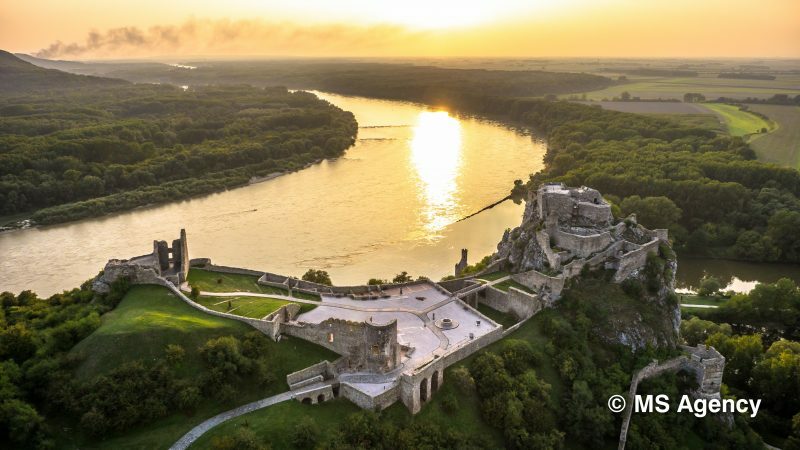 The Danube and Moravia Talk” on 24 April 2019. Throughout the season, many events are held at Devin Castle. The full program can be found HERE. This site at the confluence of the Danube and Moravia has been settled since prehistoric times. Devín was part of Limes Romanus after the Celtic period from 1st to 4th centuries. In the 9th century it was connected with the name of Prince Rastislav. A royal border fort as gradually built in the upper castle. In 1809, the castle was destroyed by Napoleon’s troops. It was declared a National Historic Landmark in 1961. While Bratislava Castle was rebuilt, Devín has remained a romantic ruin. However, this has not diminished its attractions; quite the opposite, since it is the most-visited sightseeing venue in the whole of Slovakia. It is also one of the largest castles in the country and is easily accessible from the centre of Bratislava by car, bus or bike. The bus terminus is at a large car-park below the Castle; this is also a convenient place for car-parking. The Castle is entered via the gate situated behind the Castle Gate Hotel. The effort expended in climbing up to the central part of the Castle will be rewarded with a picturesque view of the surrounding landscape. You can try out the depth of the castle well by pouring water from a bucket. However, you have still more to do to deserve the spectacular panoramic views from the Upper Castle. A long, seemingly endless fl ight of steep steps awaits you. Once you get to the viewpoint and are hit by a powerful gust of wind, you will feel as though you’re fl ying high above the land, like the hawk passing nearby. You are standing on the top of an 80-metre-high rock outcrop and you should add at least three more floors to it; such was the height of the Upper Castle. No wonder so many battles were fought over this place. In good weather conditions you can see Vienna and the peak of Schneeberg (2075 m) in the Alps. On your way down, a small path to the right behind the Middle Castle will lead you up to a grassy knoll with the ruined foundations of a church from the 9th century. It’s hard to imagine a place better suited to meditation. Back at the car-park, turn left. The road leads you to the confl uence of the Danube and the Morava. All the land across the water, whether the Danube or the Morava, is Austria. It is just a stone’s-throw away but for forty years it was an unattainable distance. Here was the barbed wire fence and many people were shot dead. Their unnecessary deaths are commemorated in a memorial bearing the names of the victims. In the meantime, if you have become hungry, return to the car-park and you can choose between the elegant hotel or a more folkstyle restaurant offering specialities like roast knuckle of pork or beef goulash. Those of you with bikes or in-line skates can continue along the Morava. The present cycle-path is the former military patrol route from which soldiers guarded the Iron Curtain. Because it was a longterm exclusion zone, the whole area along the river has retained its original habitat with its precious floodplain forests and water meadows which are home to beavers. Hikers can explore the western hillside of Devínska Kobyla (514 m), a nature reserve rich in precious and rare flora. In spring and summer, the meadows are dotted with beautiful flowers. The upper end of the car-park marks the start of a blue way-marked path which leads you out of the village. After a thirty- minute climb you are on the path, parallel with the Morava, leading to the Sandberg hill. The meadows are decorated with flowers, interspersed with occasional woodland, and you may find it difficult to concentrate on the path, so fascinating are the views of the Morava and Austria beyond the river. After another half hour’s walk, sand cliff s open out in front of you. Millions of years ago, this was the shore of an ocean and if you look carefully you will see fossils of mussels in the sand. The path will lead you to the historical part of the village of Devínska Nová Ves. Turning to the left will lead you back to the Morava and the main road. You can return to Devín by bus or walk along the Morava. Those who would like to explore this unspoilt stretch of river with paddles in their hands, and observe storks and herons on the way, should start a raft trip in the village of Vysoká pri Morave and finish beneath the Castle. A raft trip like this lasts the whole day. * One free entry per Card only.